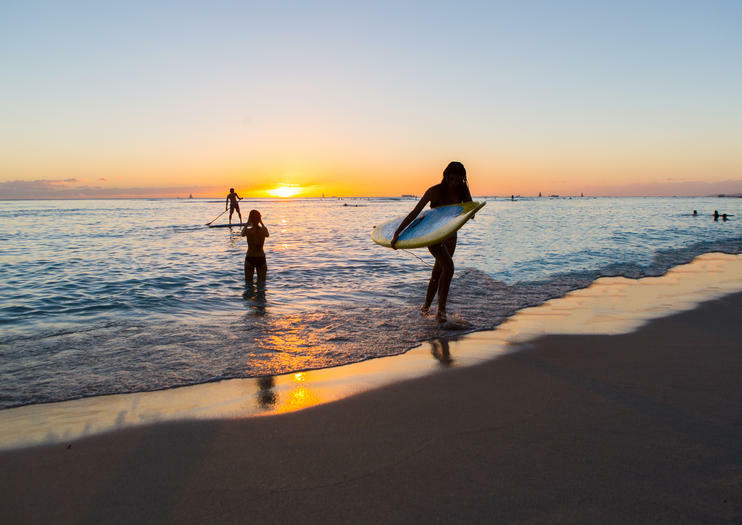 Waikiki, where most Hawaii vacations get their start, is everything at once: white sandy beaches, swaying palms, high-rise accommodations, world-class shopping, top-notch and seaside dining, local culture, and excellent surfing. It’s no wonder this former playground for Hawaiian royalty continues to be an oasis for global visitors. Waikiki is Honolulu’s city within a city dedicated to fun and sun. Stroll down the main oceanfront thoroughfare, Kalakaua Avenue, and place a lei on the Duke Kahanamoku surfer statue; splash in the surfer’s namesake Kahanamoku Lagoon; shop in one of several open-air malls; grab lunch along the way for a picnic in Kapiolani Park; and see the sunset behind the profile of Diamond Head. Waikiki sightseeing tours by trolley or Segway are a great way to learn about the area and cover greater distances than you can on foot. For a different perspective, take to the water aboard a sunset dinner cruise, or get on the water in this watersports wonderland: Learn to surf, take a stand-up paddleboarding lesson, or try kayaking, parasailing, or scuba diving. Many Oahu tours, including circle-island tours and helicopter tours, depart Waikiki and allow visitors to see sights beyond Waikiki Beach. Waikiki is a must-see for first-timers to Oahu, families, sunbathers, and more. Oahu enjoys daytime temperatures that hover around 80°F (27°C) year-round. But come nightfall in spring and winter, it can get cool—bring an extra layer if you plan to be out past sunset. Don’t forget a hat, sunscreen. and sunglasses. Though if you do, several ABC Stores—a Hawaii retail chain—offer replacements along Kalakaua Avenue. Waikiki, a 3.4-square-mile (8.8-square-kilometer) neighborhood in southeast Honolulu, encompasses everything between Ala Wai Boulevard, Kapahulu Avenue, and the oceanfront. It is serviced by several local bus routes, including the 2, 8, 9, 13, and 22. By road, the area is within 30 minutes of most main Oahu attractions, including the 23 sites covered by the Waikiki Historic Trail, Pearl Harbor and the USS Missouri and Arizona memorials, Iolani Palace, the Nuuanu Pali Lookout, the popular snorkeling haunt of Hanauma Bay, and Sea Life Park Hawaii. Waikiki’s peak season coincides with the United States’ spring, summer, and winter school holidays. If you plan to visit during these times, it pays to book tours and hotels well in advance. Several of the region’s best (and most unusual) festivals, such as the parades and cultural demonstrations of the Aloha Festival in September and the Waikiki Spam Jam in April, beckon in the off-season. Balmy Waikiki provides a tropical respite to the mainland’s chilly winters, but in these months the rains are more frequent, the waves can be wilder, and temperatures still dip a bit—expect 77 to 82°F (25 to 28°C) as opposed to summer’s 82 to 89°F (28 to 32°C). Still, warm-weather seekers will be in good company: Between November and March, hordes of humpback whales migrate down from chilly Alaska to mate, splash, and put on a show for eager onlookers. Watch the sun set over an Oahu beach on a 1.5-hour Segway tour of Honolulu’s scenic harbor, beaches and parks. Learn to steer your Segway, follow your guide through the quiet streets and take in stunning views of Diamond Head and Waikiki. Cruise past Ala Wai Yacht Harbor to a coastal canal, then watch surfers ride the breakers as you explore Ala Moana Beach Park. Glide past banyan trees and coconut palms while the stars appear above the ocean, and experience a perfect Hawaiian sunset. When visiting Hawaii, try this guided, 5-hour, small-group ocean dive from Waikiki. Climb aboard a custom, 37-foot dive boat and experience Hawaii’s fascinating underwater world, complete with colorful coral reefs and an abundance of marine wildlife. All the necessary diving equipment plus snacks and fresh water are included. Evidence of dive certification is required from all visitors wishing to participate in a certified dive. Waikiki hotel pickup and drop-off included.